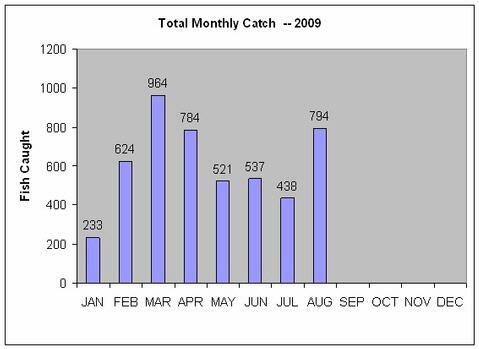 Belton Lake Fishing Guide Report – 31 August 2009 – 40 Fish – TROPHY QUEST!! This month’s Trophy Quest winner was Wayne Vaclavik of Missouri City, Texas. Wayne was guided by central Texas fishing guide Bob Maindelle, owner of Holding the Line Guide Service, based in Salado, Texas. Bob contacted Wayne well in advance of the trip to determine his preference for species and techniques, as well as to gauge Wayne’s ability level so he could best meet his guest’s expectations. On Monday, August 31st, Wayne and his brother, Richard, met Bob at Belton Lake. The trip came 3 days after the season’s first cool front had passed, shifting winds to the NE at 6-9mph, and dropping the overnight temperature to 69 F, with a surface temperature at about 85 F. Skies were fair. 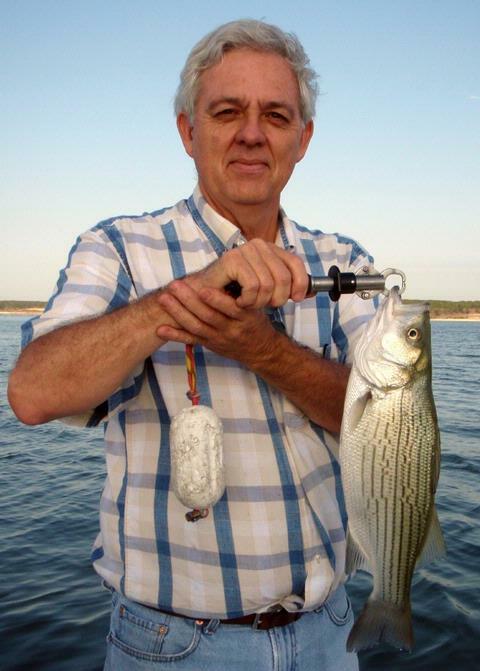 Wayne chose this lake over Stillhouse Hollow, as it offered the brothers a shot at hybrid striped bass — a fish they’d never caught before, as well as a chance to use downriggers — a technique they’d never tried before. By 6:45am the trio was hunting fish over a deepwater breakline using sonar. 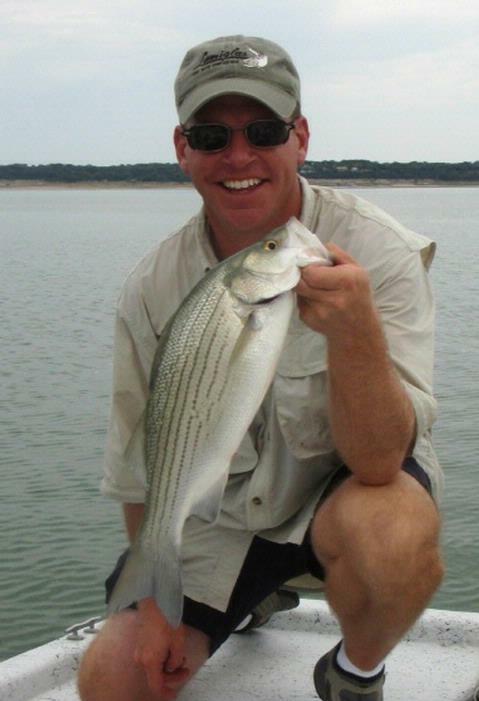 By 6:55am the first of 40 fish came over the gunnels — this one was a white bass, followed by another shortly afterwards. Although only about 11 inches in length, these two fish allowed the brothers to experience what a strike looks like using downriggers, and exactly how to properly respond and play fish hooked on this gear. As the sun rose, this early action dried up and the trio was off again in search of fish. They searched over 30-40 feet of water off a steep point. Bob marked a lot of bait on sonar and plugged in a waypoint on GPS which would allow them to return later and see if gamefish had located the bait. Next it was off to a similar point, this one with timber — nothing showed on sonar. Next, up the Leon River arm they went. 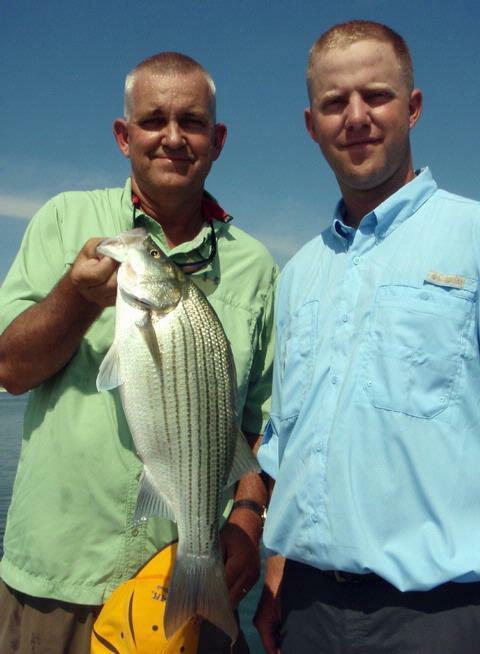 As the sun shone on the water, the spray of aggressively feeding white bass, hybrid stripers, and largemouth could be seen for over 1/2 mile away. Bob sped to the action while arming the brothers with Cicada blade baits rigged on spinning gear. Bob motored as close as he dared without spooking the fish and then covered the rest of the distance with his trolling motor. The brothers fired casts into the fray, kept the baits moving fast and up high in the water column and were immediately rewarded. 25 minutes later, after this short, intense feed was done, the boys had landed an additional 13 white bass and 3 school-sized largemouth. Next, they headed further up the Leon River arm and again searched with sonar, this time locating gamefish suspending in a horizontal band from 27 to 33 feet deep over 35 to 40 feet of water. The downriggers were once again employed, but multiple passes gave up only 2 whites and a few missed fish. Bob marked the most dense concentration of fish with a buoy and stood off a cast’s length so the three of them could work Cicada blade baits horizontally through the fish. This resulted in the first hybrid of the day, a just-legal 3 pounder, as well as a freshwater drum. This area then shut down. Next, it was off to a deepwater hump. No sooner did the boat come off plane than the sonar lit up with fish which would turn out to be a mix of hybrid striper and white bass in a horizontal band at 33-35 feet over 37-45 feet of water. Again, downriggers were the ticket. Two ‘riggers went down here with Pet spoons trailing rigged up on Lamiglas downrigging rods. As with the previous area, the fish here were a bit stubborn, but after a few passes, the team got them figured out and wound up putting 8 keeper hybrid up to 5 1/4 pounds in the boat, as well as 5 white bass and 1 freshwater drum. After about an hour spent on this area, it went quiet. The team made a final move back to that waypoint Bob had marked earlier in the morning when he sighted bait with no gamefish yet showing. Upon arrival they hooked up on a hybrid, then another, then two more white bass. By 12:10pm things had gone quiet and the boys knew they’d seen the best of it. They called it a day at that point and headed for the ramp. The day’s tally stood at exactly 40 fish, including 10 legal hybrid stripers, 3 largemouth bass, 2 drum and 25 white bass. As is Bob’s policy on all fishing trips, all fish were released in good condition to grow larger and be caught again. Lure: Reefrunner’s Cicada, 3/8 oz. and ½ oz. 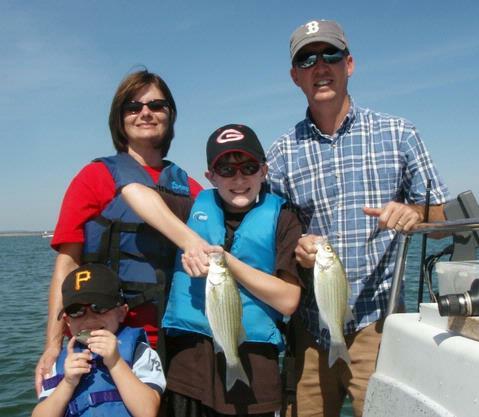 Fished a morning “Kids Fish, Too!” trip with a family of four from Georgetown. Trey and Ann are the parents of Brandon (11) and Jonathan (4). Trey and I spoke before the trip and his concern was to keep the boys busy so they’d have a positive experience. With this in mind, I opted for Stillhouse and we split the trip between sunfish and white bass fishing. From L to R – Jonathan, Ann, Brandon, and Trey. Be sure to notice little Jonathan’s sunfish proudly displayed in the lower left corner. Brandon with a 1.25 pound largemouth which went for the largest of our offerings, a Lunker Licker in silver and chartreuse. Wind: Winds were from the NNW the entire trip at about 7-9 mph. We started the trip off with bream poles in hand baited up with dilly worms for sunfish. We hit Area 510 and put 2 blacktail shiners and a sunfish in the boat, but this stop was mainly to work the kinks out and get the boys used to the equipment and the approach so they could capitalize on the better fishing at the next spot we’d hit. Our next stop for sunfish was Area 203. I had Brandon on the front deck with me and he was operating independently by now. Trey had Jonathan on the back deck and assisted him. We went through 17 fish in about 30 minutes. Our catch included several bluegill sunfish, several longear sunfish, one green sunfish, 2 blacktail shiners, and one juvenile largemouth bass. As the sun got brighter the fish got sluggish and I knew it was time to move on. By now the sun had brightened things up and the wind was steady from the NNW at ~9. Things were really looking good. We headed directly to Area 041. As we idled in, I look for signs. There was a single tern working in the area, but the presence of surface feeding largemouth (scant in number, but still there) let me know there was bait to be found here. We searched with sonar for a few hundred yards and noted all the life was in the 25-29 foot range. We put downriggers down and were immediately onto fish. 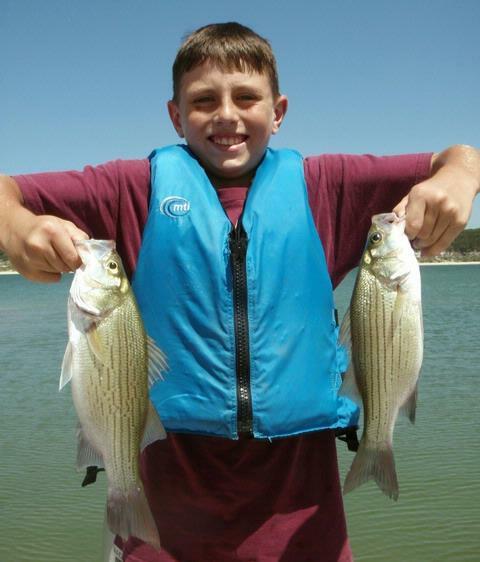 We put 3 pairs of white bass in the boat as the boys took turns on the rods and I then knew these fish were turned on. Just then it was apparent that we had to take a little unexpected potty break for little Jonathan’s sake. I was concerned about breaking the momentum of these biting fish, but, we were blessed … the fish stayed right where they were and stayed biting. We returned as quickly as we could and got right back into the swing of things. In the patch of water bounded by Areas 041, 460, and 196, we worked up 34 fish through about 10:40, when the fishing began to slack off. Our catch out of this area included 2 drum, 4 largemouth bass (all right at 13.75 to 14.50 inches) and 28 white bass going 10.75 to 13.75 inches. By 11:00 the bite was just about done and so were the boys. We called it a day at that point with 54 fish boated on a nice, dry, cooler than average late August Saturday morning. Fished a half-day morning trip on Belton today with friends Rodney T. and Roy P. The fish had a “delayed start” today with the best of the action coming at 9:45 through about 11:30 am. 1 of 9 Belton Lake hybrid taken at midday today. 4.25 pounds. Wind: Winds were light and variable the entire trip at about 5-7 mph. Well evidently Rodney and Roy don’t show up late for anything. We were to meet at 6:30am. As is my custom, I arrived 30 minutes earlier to get launched, check equipment, warm up engine, and do all of this at a leisurely pace. As I pull in at 6:00a, old Rodney’s waiting there and no sooner did I get the trailer wheels in the water than Roy pulls in. I guess we were all anxious to get our string stretched. We began the day fishing a stretch of bottom from Area 487 to Area 488. The first fish came at 6:52 and we had put 12 more in the boat by 7:50 — all white bass pretty average in size. We all had our eyes open for topwater and terns, but saw little. We headed to Area 474 again watching for topwater as we went. We graphed some fish and some bait. Roy commented he’d like to try to slab for those fish, so we gave it a try, but found nothing responding. We again rigged up with the downriggers and tried a few passes coming up with 2 smallish white bass. Headed to Area 478 — nothing. Headed to Area 491 — showed little on sonar and caught only one white. Looked at Area 511 — nothing. Downrigged Area 344-489 and came up with 3 whites right off the bat, then it went quiet. By now it was around 9:30am which is about the time the “popcorn” white bass have been showing and doing their thing. I intended to head to Area 508, but, on the way, Rodney spotted some fish on top at Area 509 up to Area 502. We got to these fish and found not just fish on the surface, but fish from top to bottom with a good amount of bait mixed in. This was looking good! Roy and I chose to go with bladebaits and Rodney went with a double bucktail rig. In all, we landed 16 fish here in no time, including 3 hybrid, most either off bottom or suspended. Around this time, ~10am, the wind went slack very abruptly, it really heated up quickly due to the stillness, and at this same time the action slacked a bit. Sweat starting coming out of every pore in my body, and Roy was really feeling the heat, so we headed back to the ramp and he and Rodney called it a day. It was good swapping stories and fish tales with them today!! Roy had never really been exposed to downriggers or using bladebaits and really seemed to enjoy picking upon the new tactics. Rodney remained enthused about using the flasher feature on sonar to watch both fish and lure movements. It’s very enjoyable when guests take such an interest. I had no plans for the remainder of this Thursday, so I headed back to Area 509 to see if I could scrape up a few more fish. I made a mental note of some topwater action happening at Area 512 as I passed by. When I arrived, I saw fish really bottom hugging right on Area 509, so I vertical jigged them with a blade and came up with 29 more fish just sitting right there hovering with the trolling motor over an area not 20 feet in diameter. Around 10:45 these fish slacked off. Next, I headed back to Area 512 where I’d seen fish enroute to Area 509. As I motored in, sonar revealed fish very regularly appearing at 31 feet, with some scattered bait. I got twin riggers down and over the next hour boated 11 fish, 9 of which were hybrids all going right at 4 to 4.25 pounds. Once this played out I investigated a bit more topwater happening between Area 169 and 483. This was primarly lone largemouth popping shad in fairly shallow water. I got 1 black and 1 white here on the Cork Rig and called it a day with a tally of 77 fish landed. Fished a morning half day trip with Mr. and Mrs. Don C. of Temple today. 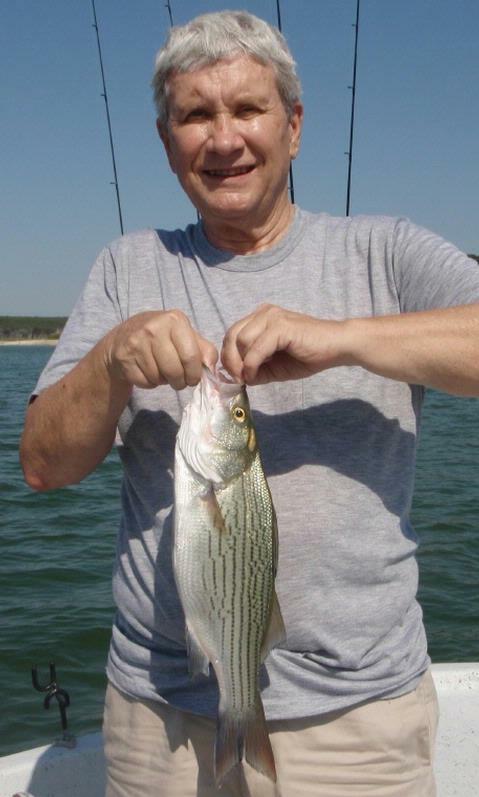 Don is a retired CPA and has been out fishing with me on a number of occasions, but never with his wife, Diane. I must say she added a nice touch of class to our trip! Don C. with a just-legal 18.25″ three pounder that fell for a downrigged spoon matching the forage size. 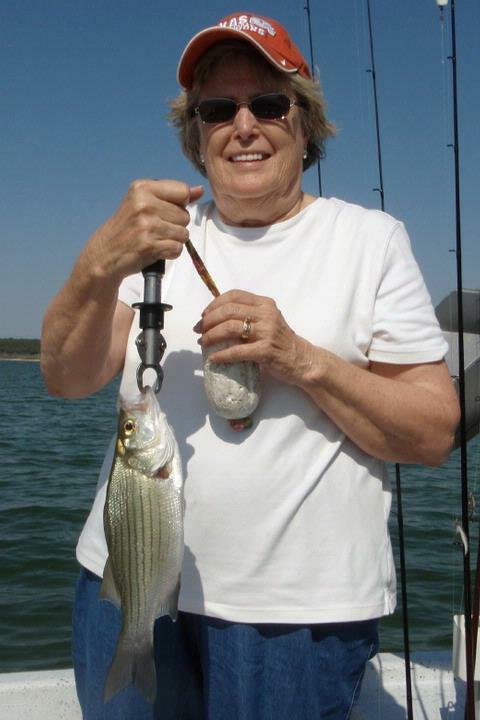 Diane C. with the best of the white bass we caught today, a 14 1/8 incher also taken on a downrigged spoon. Wind: Winds were from the SW the entire trip ranging from 4-10 mph and varying regularly in that range . After heading away from the dock we started off looking shallow for white bass and were at the right place at the right time as right at 6:45 the white bass began pushing shad toward and even up onto the shore between Areas 172 and 328. Before they headed out to deeper water, these fish drove the shad along about 150 yards of shoreline. We kept up with them and picked up fish regularly. 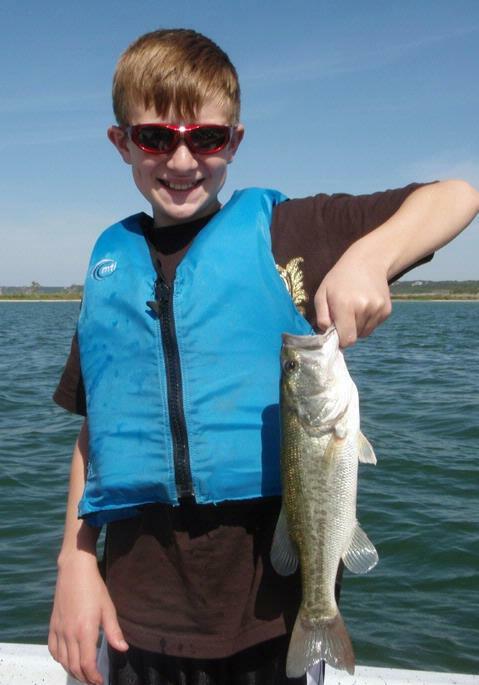 Shallower casts landed smaller fish (even juveniles), and deeper casts landed 11+ inchers. By 7:15 this shallow action had played out and we turned our attention a bit deeper by lift-dropping bladebaits in 12-17 feet of water. The fish continued to respond, and we landed a fish every 6-7 casts or so, again, averaging around 11+ inches between Areas 171 and 382. After this bite died off, we went with and stuck with downriggers in this same vicinity for just about the remainder of the trip and, as usual for summer fishing, they accounted for the lion’s share of our catch today. 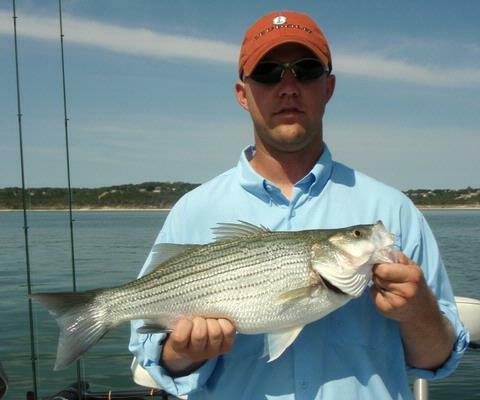 We landed white bass of all sizes, literally from 4 to 14 1/8 inches, along with a single hybrid (which was of legal length). By around 9:05 this area had played out with the sonar showing the area devoid of life from 23′ and shallower. We moved on to Area 508 and immediately began marking fish. We got both riggers down and came up with a barely short hybrid and a white bass going 13.5 inches. We continued in a trolling grid over these fish and they continued to show well on sonar, but we couldn’t buy another strike here. By now, the sun was getting hot and bright and the wind was slackening. We began to see some “popcorn” schools of whites working on shad over open water. The SOP here was run full throttle to them, cast quickly into the fray, and hope you were in time to get 1, 2, or maybe 3 fish at the most as these fish would only stay exposed for seconds at a time. We did the run-and-gun routine a few times and interspersed some downrigging in the slow times in between in the vicinity of Area 365. By 11:05 it was getting hotter, brighter, and more still, and the fish were just about shut down for good for the morning. We called it a day at that point with 46 white bass, 2 hybrid, and 1 largemouth bass boated for the effort. As we snapped a few photos to remember the trip by, Mrs. Diane insisted that Don do all the fish-holding, which he gladly did. Then, I introduced the “hands-free” Boga Grip and, to her credit, Mrs. Diane held up her own fish for a very nice photo. You’re a good sport Mrs. C.!! Fished a morning half day trip with Mr. Steve H. of Austin. What a pleasant, easy going fellow. I really enjoyed his company. Steve is semi-retired from the computer industry. He fishes a lot, but admittedly doesn’t catch a lot. He wanted to get some basics down on techniques, sonar interpretation and fish location, so I tailored the trip to meet that expectation and we were rewarded for our efforts. Steve stated that he does what I find a lot of anglers do, which is to visit the same spots over and over based on past success, but without really observing for natural clues upon arrival. We worked on changing his approach to things, and started with using our underwater eyes called sonar. Steve H. with a 3 pound hybrid taken via downrigging at 21 feet this morning. Wind: Winds were from the SW the entire trip and tapered from 2-3mph pre-dawn, steadily up to ~13 by near noon . After meeting one another, we headed out slowly and I immediately began pointing things out and answering questions about sonar. We were very fortunate today to find abundant bait at the first area we searched. In the few minutes before dawn, we spotted and cast to schools of smallish white bass and short hybrids feeding just sub-surface and occasionally breaking the surface, between Area 171 and the shore. These fish stayed on or near the top for about 25 minutes allowing me to introduce Steve to the use of blade baits and the Cork Rig. By the time the last of these schooling fish broke the surface, we’d already boated 16 fish and the sun was barely clearing the horizon. Now, knowing the fish were still shallow, based on both experience and sonar readings, we worked our blade baits lift-drop style and continued to pick up fish, albeit less frequently then when they could be seen on top. Once that blade bait bite died, we searched a bit deeper still and put the downriggers to work for us. As usual, these summer time fish really loved the speed and horizontal presentation and we caught fish after fish, often having a fish on one ‘rigger as soon as it was set to the point where we only had one rigger in and working at any given time for about a 40 minute span. Steve landed 2 legal hybrid in all this action and we missed a third. After feeling that he had the hang of downrigging, Steve let me know he was ready to learn more. This time, we slipped out to a bit deeper water as the fish were continuing to move deeper as well. I’d previously rigged up slabs. We began fishing them vertically and keeping the baits on sonar while hovering with the trolling motor. We took 2 whites that way. Next, we added a twist by smoking these lures – 2 more whites. Next, we fish them lift-drop style in a more horizontal fashion – 2 more whites. Finally, we then hit a 10-12 minute dry stretch. By now it was nearly 10am and the bite was beginning to go soft here. Steve had to make a run to Dallas to help one of his daughters, so we planned to wrap up a little earlier than usual. I suggested he shouldn’t go home having ended on a dry spell, so we rigged up the downriggers for one last hoorah and came up with 2 nice white bass in no time to polish off the trip nicely. I returned Steve to the ramp safely with 46 fish under his belt and hopefully more confidence to find the fish by putting nature’s clues together for himself the next time he gets a chance to chase ’em. After dropping Steve off, I spent about 90 minutes looking for other concentrations of bait and/or gamefish. Once I located fish, I fished until I landed just one, and then moved on before the bite died completely so I’d have some other areas to fish for trips later this week. I was successful in finding fish at Area 507 (on top), at Area 508 (suspended at 30-34′), and in the open water between Area 507 and 310 (noted terns working pretty hard in this area). I landed 2 fish on topwater and 2 on downriggers from these 4 areas and called it a day. Fished a 1/2 day morning trip today with Mr. Paul Johnson and his son, Daniel. 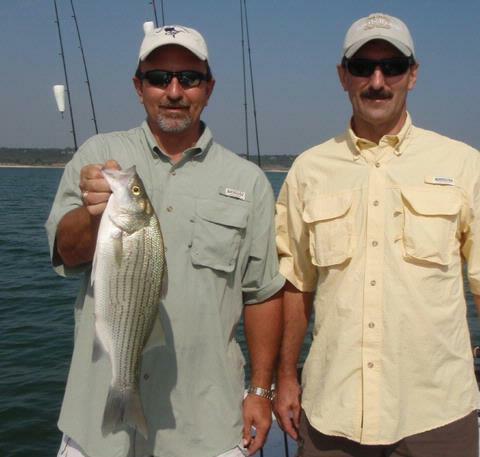 Paul is a Laguna Madre guide (captain) working for Bruce Shuler’s Getaway Adventures lodge in Port Mansfield, TX, and Daniel is a non-commissioned officer in the US Army stationed at Ft. Hood. The two decided to try something with a little less salt in their diet for today. Paul with a hybrid just shy of 7 pounds taken under terns around mid-day. Daniel with a hybrid going 5.5 pounds taken out of a small, suspended school of fish in around 31 feet of water. Skies: Skies were clear until around 10am when cumulus clouds began to build going quickly from 20% to over 90% cloud cover with thunderheads building all around the region. Following the passage pf the light rain from 2:00 to 3:30, it remained humid and grey with high 90’s. As we began the day with flat calm waters, we found scatter, brief surface action fueled by whites and short hybrid working the surface over open water from Area 496 to Area 497 in the 15 minutes prior to sunrise. As so often happens, once a school was sighted and we got to them, the fish would disappear very quickly. We managed just 1 short hybrid on a Cork Rig. At sunrise a light N wind began and the switch went off on the topwater. We then broke out the downriggers and never put them away for long for the rest of the trip. We downrigged from Area 307 to 474 and immediately got into what would be the best fish of the trip – a nice series of 4-5 pound hybrid all taken at 31′ on Pets. We had a few white bass mixed in with these, as well. Once these fish and the bait were were seeing on sonar dissipated, we checked out from Area 168 around to the E. of Area 472 and managed some short whites and a small blue cat. We moved to Area 154 and found lots of bait and very small whites here, as well so we moved on. At around 9:45, I spotted some terns pointing the way to some open water surface action over Area 344 to 489. We got to the terns and found “popcorn” whites spread over a pretty sizeable area of water. We both chased and waited and got into the fish twice, but only for short whiles, allowing us to put 9 more fish, all 11.5 to 12.5 inch whites in the boat. After the surface quieted down, we thoroughly worked over this area with sonar and downriggers and added 4 more keeper hybrid to the tally, including the largest of the day caught by Paul which went just a shade under 7 pounds. Once these fish quit, things got tough all over — it was the beginning of the end of the morning feed. We hit Area 155. As we came into the area, a single school of small whites erupted boatside. I pulled one white out and Daniel hooked a short largemouth from the mix. We left these fish and returned to Area 307 – 474 and zeroed. We stuck one last barely keeper hybrid right off of Area 506, and then called it a day with a total of 36 fish taken, 15 of which were legal hybrids. After dropping Paul and Daniel off, I headed out to search for additional concentrations of bait for an upcoming trip. It was just beginning to cloud up significantly and I failed to locate bait on sonar at one area I very much expected it to be, so, I took a little detour, got out my 2 wt. flyrod and hunted some sunfish to pass away the “dead time” from noon to 4pm. From 1:15 to 3:30, I put 38 sunfish in the boat consisting of a mix of ~60% bluegill, 20% green sunfish, and 20% longear sunfish. No yellowbellies hit today. I found these fish at Areas 503, 184, 185, 504, and 505 with each giving up about the same number of fish; Area 503 was the best producer. With some turbulence in the air and some local thunderstorms cropping up. I holed up in the back of a cove and waited on conditions to improve for about 40 minutes or so. By 3:30, things were looking better and the skies were greyed a bit, so I again began the search for more concentrations of bait. I finally found solid sonar readings at Area 171 over to Area 437. There was a stong presence of gizzard shad in here, and so I decided to test the waters with the downrigger. I found there were significant numbers of legal hybrid mixed in with this bait. These hybrid were tight to the bottom. From 3:45p to 7:50p, I downrigged a circuit through these fish and put 31 fish in the boat, of which 21 were legal hybrid, 7 of which went over 5.5 pounds. The remainder of the fish were either average white bass or very short (juvenile) hybrid. Around 7:50, the first little bit of what would be a very light surface bite began. I moved up into the fish I could see and fancast a blade into and beneath them. By dark at 8:30, I’d put 11 more fish in the boat, all of which were juvenile whites or hybrids. I fished a half-day morning trip today on Stillhouse with 2 young men headed to 5th Grade this coming Monday — Josh V. and Aaron C., both of Harker Heights. This was the sixth SKIFF Program trip that I’ve run. 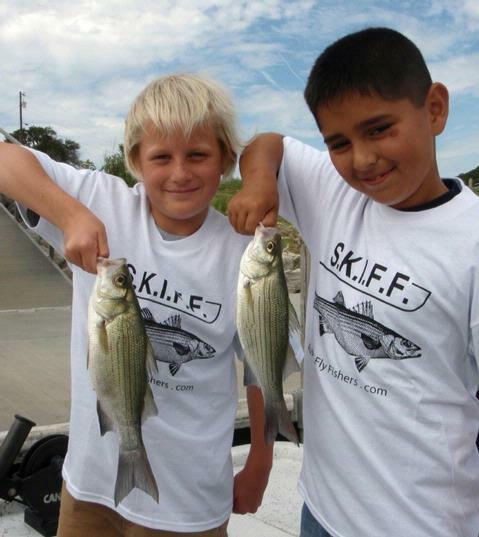 SKIFF stands for Soldiers’ Kids Involved in Fishing Fun. 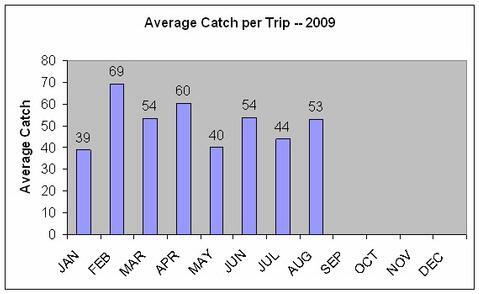 SKIFF trips are funded by donations both given by and collected by the members of the Austin Fly Fishers. AFF has commissioned me to take the children of soldiers deployed in harm’s way and the children of soldiers who have died while on active duty on guided fishing trips. Josh’s dad is currently serving in Baghdad, Iraq, and Aaron’s dad passed away while on active duty. Josh V. (L) and Aaron C. (R) show 2 of 24 fish taken by teamwork today!! Wind: Winds were light from the SE at around 6 at sunrise, increasing to 13 by 8:45am and staying steady at that velocity the remainder of the trip. Skies: Skies were partly cloudy (~70%) all morning. Aaron, Josh and I departed the dock at sunrise and spent a bit of time visually searching for topwater action while the winds were light and the sun low. We initially searched from Area 126 to Area 254 with little sighted. We then headed to look over Area 232 and did spot fish over deep open water feeding very randomly and in small packs way out to the east of this area. The surface area over which these fish could be seen was quite vast but the density of the fish was minimal. This was not a suitable situation for young casters as it required quick, very accurate casts and a rapid retrieve. We motored from one pack of fish to another only to find the same thing at each location — very scattered, briefly appearing pods of schoolie-sized largemouth. I decided downrigging was once again going to be the order of the day and got the boys trained on the equipment in short order. We trolled a strip from Area 454 to Area 207 and came up with nothing. We then took it over to Area 458 and found very consistent action from suspended and bottom-hugging white bass in 23-26 feet of water. We got into a groove here where one boy would hookup, and the other would bring in the released downrigger ball, I would unhook the fish, and the boy doing the catching would then set his line back out and get it ready to catch again. We went through 14 fish this way, including one double, all but one of which were white bass right at 13.25 inches (the other was a 15.5″ black bass). On one of our trolling passes, I spotted some solid bottom-oriented fish and threw a buoy intending to try to give the boys a chance to work bladebaits down on bottom for a change of pace. As we got set up with our faces to the wind and in a hover position with the trolling motor, we cast our bladebaits out and worked them lift-drop style back to the boat. We wound up with 6 fish caught this way, all white bass around 11.75 inches. Once that school of fish played out, we returned to downrigging and pulled 2 more whites out of this vicinity while noticing the fish and bait were thinning out pretty good. We then headed out to find more fish and bait. We scouted Areas 444, 471, and 196, and finally found a few fish on sonar at Area 460 and worked a couple passes just to catch 2 of these to finish off the trip on a good note. By now it was getting time get the boys back to dockside so we called it a great trip with 24 fish taken and released. Fished a morning trip today with Mr. Paul B., and his 11 year old son, Lane. Paul is the Sales Manager at Mac Haik Dodge in Temple and is a real nice fellow who thinks the world of his son. Lane’s an athletic soon-to-be-6th-grader heading to middle school in Troy this year. I really enjoyed their company and their willingness to change tactics to do what it took to stay on the fish today. Wind: Winds were from the SE at around 14 until about 8:15 when they slacked just a bit. By 10, they were back up to 15+ and were slowly turning SSE to S.
Skies: Skies were clouded until 8:15 with some low grey, fairly thing clouds in the eastern sky. In part due to the enjoyable time I experienced yesterday pursuing a record book Junior Angler fly rod category catch for a young lady from Austin, I phoned Paul last night to see if he thought Lane might be interested in doing something similar. Paul thought he would, so we planned our trip on Belton with the intent of targeting some sunfish on the fly after fishing for whites and hybrid for a while. As we headed out, our first stop was in open water. We downrigged right off the bat as there was no apparent surface action (which would have been tough to see anyway, due to the wind). We picked up 2 white bass immediately between Area 487 and 488, but the fish moved off quickly. Right at and following sunrise, we also downrigged from Area 496 to Area 497 and scratched, despite seeing good hybrid schools on sonar and trying a variety of sizes of presentations. We then headed over to Area 483 and picked up 4 white bass, but they were all yearlings. We then moved to Area 477 at around 8:30 and spotted the first topwater action of the day extending from here to Area 500. We got on these fish as quickly, but carefully, as we could and worked them over pretty good with bladebaits worked just sub-surface when the fish were visible, and on a countdown to 10 once they’d disappeared. We caught 33 fish during this peak time. After the fish here left the surface for good, we downrigged in the same general area and over toward Area 474-475. We picked up 2 more whites and a largemouth. I then spotted a school of hybrid feeding topwater at Area 501. We got there too late, but, just yards away, 3 separate schools of white bass began working. We caught 5 more white bass here before the fish “went popcorn” on us and began to feed in smaller pods and for very brief periods of time (just seconds in length). We returned to downrigging at Area 474-5 and put 2 more white bass and a drum in the boat as I kept an eye out for any more surface action to restart. We did return just briefly to Area 501 only to find some largemouth had moved in and were feeding singly on larger shad. This required very quick, very accurate casting and, in summary, we decided just to leave these alone. By now we’d racked up a tally of 46 fish and decided to turn our attention on that record fish that we’d planned to hunt for. I gave Lane just some basic pointers on flycasting and then let him learn with his hands on the rod. Once he got a roll cast down, we were ready. We went to Area 499 and sight fished for sunfish. I put my polarized glasses on Lane so he could follow the fly and watch the fish respond to his presentation. He watched the fish approach, attack, then quickly spit out the artificial fly and realized he had to react once that fly was taken. Once that sank in, he did well. His first fish landed on fly gear was a 2.5 inch bluegill. Next came a 5 1/8 inch bluegill weighing 1/8 lbs. We placed that one in the box as a potential record book catch. Lane landed 2 more small green sunfish as well. It was apparent that no more fish here were going to exceed the 5 1/8 inch mark, so we took a look at Area 492. Nothing. We make one final stop at Area 502. Now with confidence, Lane doubled his casting distance and placed his fly consistently over some rocks holding sunfish. His first take came from a nice redbreast sunfish (a.k.a. yellowbellow sunfish) easily identified by its long “ear” flap. It went 6 1/8 inches. We now had two records on board!!. 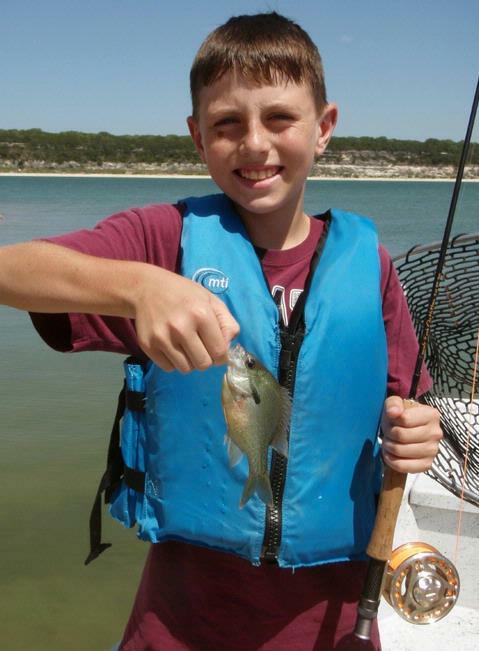 Lane kept working these fish over and landed 2 more sunfish for his efforts. By now the rest of the population was wise to his tricks and we decided to call it a good day. We took all the required photos, weights, length measurements, etc. required for the record book entries and bid one another farewell. I asked Lane what his favorite part of the trip was — he didn’t even hesitate — he said, “I liked the flyfishing.”. 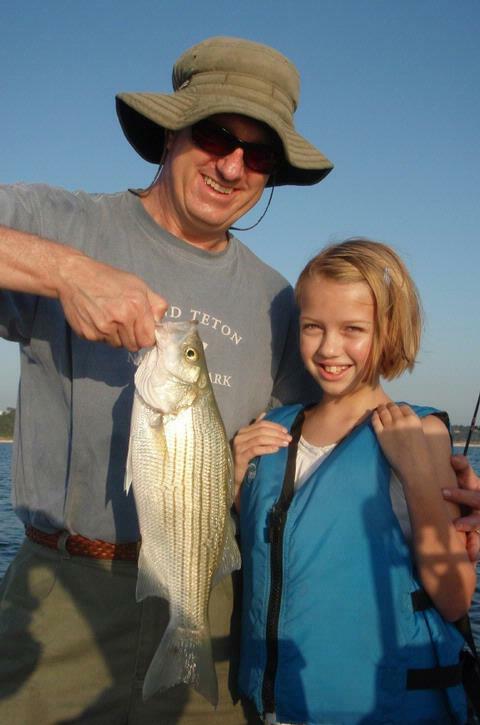 Fished a morning “Kids Fish, Too!” trip today with Mr. John J. of Austin, and his 9 year old daughter, Margaret Lee. Both were a joy to have onboard — Margaret Lee was enthusiastic and willing to try new things, and John was there to see his daughter be successful — and that she was! Wind: Winds were from the SSE the entire trip, with the stongest breeze at ~11 pre-dawn, then tapering back to 7-8 by mid morning, then going only 4-5 by trip’s end. Skies: Skies were fair the entire time. We had originally planned to fish Stillhouse today, but I was just so impressed by Margaret Lee and her family in speaking with them by phone prior to the trip that I offered to do something a little special. 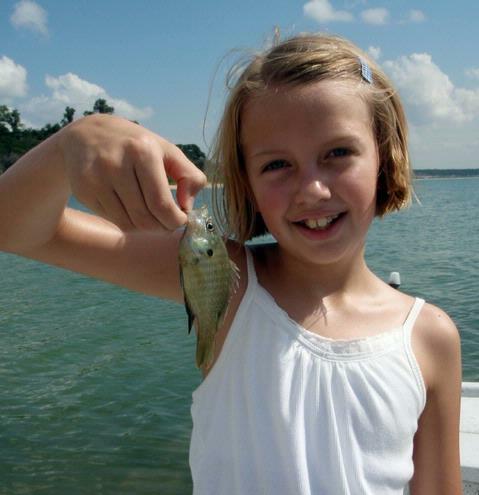 We specifically pursued a TPWD Junior Angler record for Margaret Lee and were successful in our pursuit. As the day started off, we had a tip from an older gentleman launching out just as we were about reliable surface feeding white bass. We spent a bit of time looking where he invited us to, but, as they usually do, the surface feeding whites proved elusive. We moved offshore a bit and looked with sonar and, right at sunrise, spotted strong signals from suspended white bass and hybrids in 25-28 feet from Area 487 to Area 488. We got the downriggers down and immediately started putting fish in the boat on the Pet / Licker combo. Between 7:30 and 9:30am we boated 21 fish including 16 white bass up to 14 inches, and 5 hybrid at the areas above and along a parallel track just a bit deeper, from Area 496 to 497. For a very brief time (perhaps 10 minute span) some low grey clouds began to obscure the sun at around 8:15. When this happened, we had some fish began to topwater feed all around us. These “popcorn” fish didn’t stay up long at all so we stuggled to get to them and cast before they disappeared. We did manage 3 fish from off the top, but then returned to our downrigging. By 9:30, this action was past-peak and I knew we had a pretty sizeable task ahead of us if were were to get a record-book fish for Margaret Lee. First, we’d need to get her able to use fly gear at a basic level, then find the fish to catch, then catch them. The area I most wanted to try for sunfish (Area 492) was being significantly impacted by the wind, and we had a hard time making anything happen there. We moved on and tried Area 498 and found little. Finally, at Area 499 we hit the jackpot. There were abundant sunfish here and not minutes after arriving, Margaret Lee was fast to her first fish caught on flygear — a 2.75 inch, immature bluegill sunfish. I put it in the livewell just in case she couldn’t better it, but those fears were laid to rest when she quickly came up with a 4.25 inch green sunfish. Satisfied that we probably wouldn’t better that fish at this area given the conditions, we kept that fish as our record entry, and then changed over to a bream pole and float baited with worm to continue catching the remaining sunfish we found visible there — 13 in all. Margaret Lee got her nerve up at this point and not only touched, but held one of the fish she caught, and then went one step further and removed the hook from several other fish both with and without the use of forceps — pretty impressive!! By 10:45 it was getting still and hot, and our goal had been met and rejoiced over, so we decided to call it a great day at that point. Margaret Lee’s Junior Angler Flyrod category record application for her 1/8 pound, 4.25 inch green sunfish is on its way to Austin. In about a week’s time she’ll get an official certificate from the State of Texas, and an electronic entry on the TPWD’s website.